Despite advances in wireless technologies, many computer networks in the 21st century still rely on cables as a physical medium for devices to transfer data. Several standard types of network cables exist, each designed for specific purposes. Invented in the 1880s, "coax" was best known as the kind of cable that connected television sets to home antennas. Coaxial cable is also a standard for 10 Mbps Ethernet cables. When 10 Mbps Ethernet was most popular, during the 1980s and early 1990s, networks typically utilized one of two kinds of coax cable - thinnet (10BASE2 standard) or thicknet (10BASE5). These cables consist of an inner copper wire of varying thickness surrounded by insulation and another shielding. Their stiffness caused network administrators difficulty in installing and maintaining thinnet and thicknet. Twisted pair eventually emerged during the 1990s as the leading cabling standard for Ethernet, starting with 10 Mbps (10BASE-T, also known as Category 3 or Cat3), later followed by improved versions for 100 Mbps (100BASE-TX, Cat5, and Cat5e) and successively higher speeds up to 10 Gbps (10GBASE-T). Ethernet twisted pair cables contain up to eight (8) wires wound together in pairs to minimize electromagnetic interference. Two primary types of twisted pair cable industry standards have been defined: Unshielded Twisted Pair (UTP) and Shielded Twisted Pair (STP). Modern Ethernet cables use UTP wiring due to its lower cost, while STP cabling can be found in some other types of networks such as Fiber Distributed Data Interface (FDDI). Instead of insulated metal wires transmitting electrical signals, fiber optic network cables work using strands of glass and pulses of light. These network cables are bendable despite being made of glass. They have proven especially useful in wide area network (WAN) installations where long distance underground or outdoor cable runs are required and also in office buildings where a high volume of communication traffic is common. 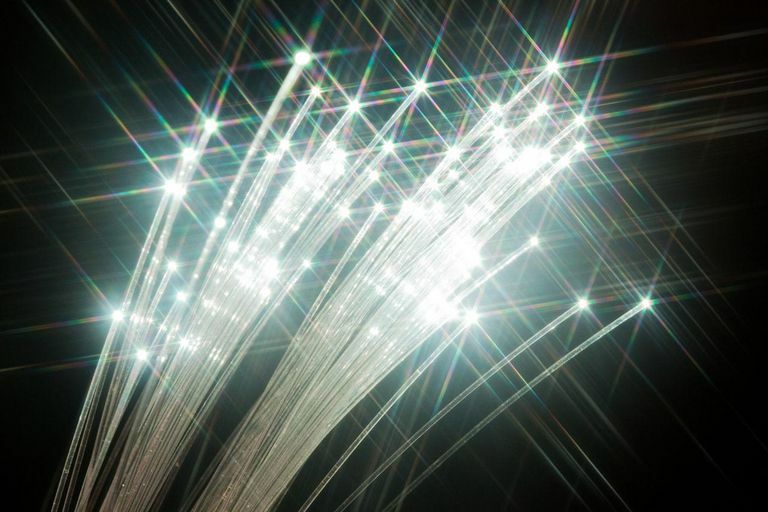 Two primary types of fiber optic cable industry standards are defined – single-mode (100BaseBX standard) and multimode (100BaseSX standard). Long-distance telecommunications networks more commonly use single-mode for its relatively higher bandwidth capacity, while local networks typically use multimode instead due to its lower cost. Most Universal Serial Bus (USB) cables connect a computer with a peripheral device (keyboard or mouse) rather than to another computer. However, special network adapters (sometimes called dongles) also allow connecting an Ethernet cable to a USB port indirectly. USB cables feature twisted pair wiring. Because many PCs in the 1980s and early 1990s lacked Ethernet capability, and USB had not been developed yet, serial and parallel interfaces (now obsolete on modern computers) were sometimes used for PC-to-PC networking. So-called null model cables, for example, connected the serial ports of two PCs enabling data transfers at speeds between 0.115 and 0.45 Mbps. Null modem cables are one example of the category of crossover cables. A crossover cable joins two network devices of the same type, such as two PCs or two network switches. The use of Ethernet crossover cables was especially common on older home networks years ago when connecting two PCs directly together. Externally, Ethernet crossover cables appear nearly identical to ordinary (sometimes also called straight-through), the only visible difference being the order of color-coded wires appearing on the cable's end connector. Manufacturers typically applied special distinguishing marks to their crossover cables for this reason. Nowadays, though, most home networks utilize routers that have built-in crossover capability, eliminating the need for these special cables. Some networking professionals use the term patch cable to refer to any kind of straight-through network cable being used for a temporary purpose. Coax, twisted pair and fiber optic types of patch cables all exist. They share the same physical characteristics as other types of network cables except that patch cables tend to be a shorter length. Powerline network systems utilize a home's standard electrical wiring for data communication using special adapters plugged into wall outlets. What Are Crossover Cables Used For? How Do Online Gamers Use a Lag Switch to Cheat?